When writing a tribute for a friend, you will probably think about the occasion first. Tributes are often a part of both happy and sad occasions -- including weddings, anniversaries, reunions and award ceremonies, as well as memorial services and funerals. Interestingly, though, lightness and humor can be just as acceptable at a sad occasion as at a joyous one. What counts the most is your knowledge and appreciation of the person himself. Think about and make notes on the person's worth and accomplishments -- these are in large part what tributes are all about. How much and what you should say about accomplishments, though, depends on your relationship with the person and with the other people in your audience. If you are a coworker, for example, you'll probably know things about the person's contributions to the organization that others will not know and will appreciate hearing about. If you know the person only as a friend, you can speak about more personal accomplishments. Brainstorm or make a list of personal characteristics that make your friend special -- virtues like patience, kindness, loyalty and trustworthiness and also those little "faults" everyone has. Maybe your friend does not suffer fools gladly; perhaps he is extremely absent-minded or does not know how to coordinate his attire. Such little faults make people who they are too. Brainstorm specific stories about your friend that illustrate what makes him who he is. Did he once jump your car for you at five in the morning in the dead of winter? Did he give up golf, his favorite pastime, when he became a father so he could spend more time with his baby? Has he been known to drive all the way to work still wearing his pajamas? What about the time he applied weed killer instead of fertilizer to his entire lawn? Organize what you want to say. A chronological order using the stories may work well. Other ways to organize are by the accomplishments and by the virtues and "faults" you have written down. A joke or a quote, either serious or funny, can be a good way to begin a tribute. 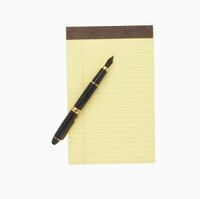 Write from your notes so you have a "script" to speak from or a written version of the tribute. Tributes are inherently personal, so "write the way you talk" is probably a good guideline. Do not tell stories that could be embarrassing with permission. Do not tell embarrassing stories or secrets without your friends permission.